As a child, Huang Yi longed for a robot companion. As an adult, he created a robot to dance with. Acclaimed Taiwanese choreographer and dancer Huang Yi and his robot companion KUKA bring razor sharp precision and stunning artistry to 3LD Art & Technology Center. 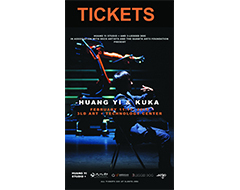 Harmoniously weaving together the art of dance and the science of mechanical engineering, HUANG YI & KUKA is a poetic work that flawlessly intertwines modern dance and visual arts with the realm of robotics. Huang’s works have received high praise at venues internationally, including the Ars Electronica Festival (Austria), Joyce Theater, Engien-Les-Bain Centre des Arts (France), Nimbus Dance Works (Jersey City), Cloud Gate 2 (Taipei), the Indonesian Dance Festival (Jakarta), New York Live Arts, and the American Dance Festival (North Carolina). Huang’s collaboration with Cloud Gate 2 toured internationally in 2012, to much acclaim. He has received awards for his work at Digital Arts Center Taipei and the 3rd Cross Connection Ballet International Choreography Competition in Copenhagen, among many others across Europe and Asia. HUANG YI & KUKA is part of 3-Legged Dog’s Artist Residency program and their 3LD/3D+ program. The production will be filmed in 2D and 3D for submission to international film festivals and eventual worldwide distribution. The production is the first residency in a new international consortium called QA Ring initiated through the Quanta Arts Foundation (Taiwan) and including 3LD (U.S.A.), Culture Yard (Denmark) and Ars Electronica (Austria). QA Ring is focused on creating and touring digital performance art. The first phase of HUANG YI & KUKA was presented at the 2013 Ars Electronica in Austria and won the Taipei Digital Arts Performance Award at Digital Arts Center Taipei. Huang’s three month long artist residency at 3LD allowed him to expand HUANG YI & KUKA into a full-length performance.